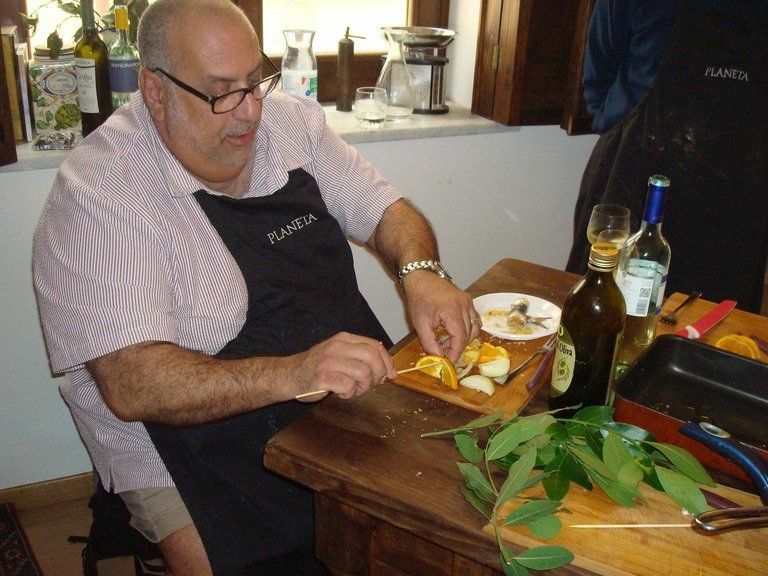 ONE DAY COOKING CLASS PLUS LIMONCELLO IN PALERMO SICILY! Come in our kitchen and enjoy a hands-on cooking class followed by a wonderful full course meal. 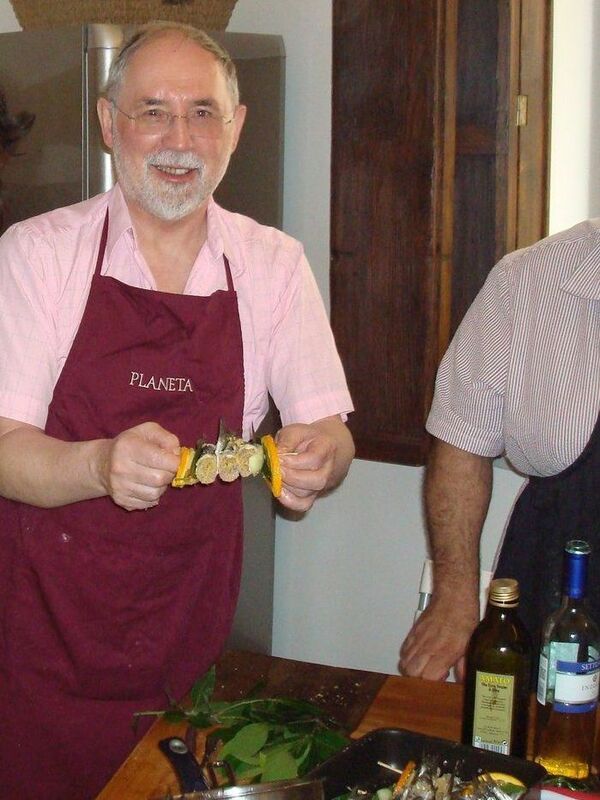 Join a unique cooking classes in Palermo and discover the secrets of our traditional cuisine. You will learn how to cook some of authentic and Sicilian typical dishes (pasta al forno, sarde a beccafico, arancine, pasta con le sarde, involtini di pesce spada, cannoli, cassata and much more). And also you will learn how to make the authentic Sicilian Limoncello made following a traditional recipe and method. The lemons we will use are: Femminello, Lunario, and Verdello that we grow in our farm nearby the Natural Park of Nebrodi, in front of the Eolian Isles. 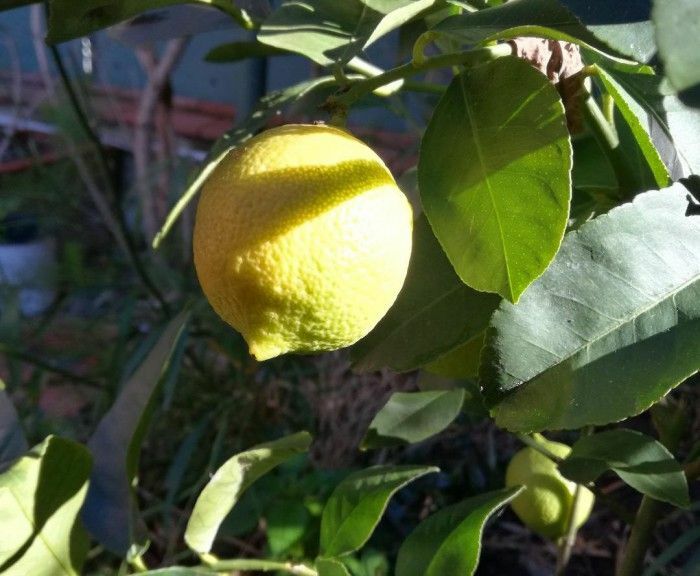 The Chef uses only naturally raised lemons from her garden that blossom and bloom four times per year. We start off the class with an informal discussion on the history behind the lemons and how they made their way to the area. 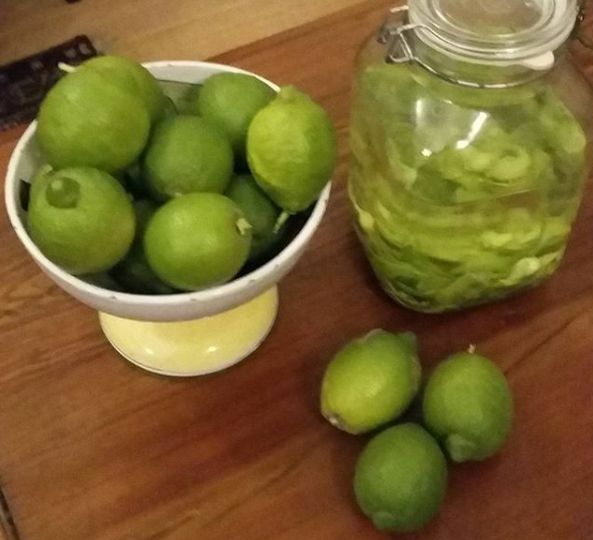 Then it is hands-on, where you will peel, mix and make the famous lemon liqueur. And at the end you will take away a bottle with you! We start with a walking tour around the most beautiful Market, where chef Patricia or Giuliana will give you plenty of tips on picking local, seasonal products. They will go to visit together with you the fruit & vegetable vendor to find out what’s in season and the fishmonger to choose the best fresh catch of the day in Palermo’s historic fish market. You will pick up the ingredients for your hands-on cooking class while learning about the local in-season products, Patricia and Giuliana’s family traditional recipes. Their main inspiration is based on the roots of a familiar cooking tradition, mother and grand mother excellent cooks, improved by the experience, the study, but most of all because of passion! Along the way going back home you will pass through the most beautiful historical area of the city, rich of monuments and beauty, before arriving in our charming home nearby the old market Vucciria, where you will continue your cooking experience and you will end your day adventure enjoying the food you have prepared in a friendly and casual atmosphere!! Each hands-on cooking class includes the preparation of a full Sicilian menu including a typical Sicilian dessert. Lunch or dinner follow featuring the foods prepared in class and are accompanied by a selection of very good local Sicilian wines, dessert included. Our Sicilian cooking course is set in an elegant setting with an experienced chef with a wider experience about the sicilian world of wines, of sicilian culture and history. You will discover what makes Sicilian cuisine different: the food, certainly, but there's much much more... Take home the taste of Sicily! Don't miss out! We offer cooking classes for individuals and groups, also private groups, and team-building workshops for companies. Cooking Class and Market Tours are available Monday to Sundays, begin at 10:00am and located nearby the oldest and charming market VUCCIRIA. Private cooking classes and different starting times on request. Make authentic, fresh Sicilian pasta, in different shapes and size such as the typical ‘’busiate’’ from Trapani, or the classical ‘’tagliatelle’’. Under the guidance of our chef you will learn all there is to know about making fresh pasta. You will knead, cut, roll and fill ravioli, typical sicilian busiate, tagliatelle, tagliolini or other varieties. Her recipes are all based on freshness, high quality of ingredients, tradition and, most of all the chef's long experience. Your chef will explain and show the technical aspects of homemade pasta preparation, in Sicily usually eggless, including the preparation of three different sauces. With this expert guidance, you will be making homemade pasta in your own kitchen like a pro! This class is also highly recommended for families with kids. JOINABLE CLASSES RUN FOR A MINIMUM OF 3 PEOPLE. Should the minimum not be reached for the day you selected, you will be given the choice to pay an additional fee for a private class, change your date to another day. Note that because we only use fresh, seasonal ingredients from local suppliers and farms, the menu will vary depending on what is available that day. Please do let us know if you have any food allergies or preferences. How do I find a personal or private chef? Click here! We had a great 6 hour experience, shopping for ingredients in the open air market of Ballaro'. The Patrizia had us participate in creating a 4-5 course meal that we then appreciated at her studio. Lots of excellent food , very good Sicilian wines and and great sense of humour. Highly recommended. We had a wonderful time at both the wine tasting and the cooking class. Alfredo and Patrizia are very warm people who make you feel at home. We enjoyed the wine and cheese one evening and the cooking class the next day for lunch. Before preparing lunch, we accompanied Patrizia to the open market for the grocery shopping and that was lots of fun. Overall a great experience. Hands down the best part of our visit to Palermo. We planned on doing a wine tour based outside of Palermo but soon discovered it was slightly difficult in terms of transport. Instead we booked with Alfredo and are so glad we did. We tasted 6 generous glasses of wine not to mention delicious cheeses, caponata and dessert. We felt we were in the home of a family member. Definitely worth the money - an amazing experience! Grazie Mille!!! Definitely a recommendation for everybody who enjoys lovely home made food, good wines and a great host. Patri is such a nice person who is not only very warm hearted but also very knowledgeable about Sicilian culture and cuisine. If you are in Palermo a must-do! My friend and I spent the day with Patrizia and her daughter. We walked through the market, cooked in a home, followed by a wine and cheese class. Her family and friends are so lovely and we had such a great time getting to know them. Afterward, we all went to a local bar and walked around the city. This was by far my favorite thing I did in Palermo. I highly recommend both classes!! I booked this wine and cheese tasting a couple months prior to getting to Palermo The day before we were supposed to meet I called Donna Patricia, the owner, to see if we could change the time. She was very accommodating and agreed to change our meting time. She met us right on time. She led us through the narrow streets to a small apartment in a beautiful restored old building that she does her business in. We sat and relaxed at her table as she opened 6 different wines for us to taste. She provided us with cheese, homemade caponata, toasted bread, nuts and dessert. All the while we sat and talked like old friends. It was so relaxing and interesting. We learned lots about the area, the wines we drank and Sicilian culture and cuisine. Donna is very friendly and easy to talk with. It was a nice relaxing 3 hours that we enjoyed thoroughly. If you are looking for something different to do while in Palermo and enjoy wine and cheese this is the one you should book. I know she also does walking tours and cooking classes. Next time we are in Palermo we will cook with her. After a short walk through the mercato del capo we had very warm welcome at Patrizias home. Everyone got to cut some ingredients for the menu. While Patrizia explained a bit how to prepare the dishes and stared cooking she shared very funny and interesting stories about Sicilian family life and Sicilian cuisine!! We (in total 8 participants, maybe a bit too many for a cooking lesson but all of them nice people) got to taste some cheese, olive oil and wine while she prepared the dishes. We had a wonderful time!! I just would have like to really cook a little bit instead of just do a bit of cutting. But Patrizia and her daughter made up to that! Highly recommended to who wants to get in touch with the locals! This was an exception experience. Very small group. They aim for 6 max. The heart of the tour is in the old city, where we'd find most of the places we wanted to see. They are Palermo residents and they LOVE the city. Informative, small group, best part of the town to visit. That was good enough. The first tour included a home cooked meal. It was fun, delicious, informative, and very relaxed. They host this at a beautiful little apartment in the heart of the old city. Lively conversation, laughter, and great insights into Sicilian cooking. We took a second tour which was a visit to the outdoor market (an event in itself) to buy the food for another meal. Which the small group of us would cook that day. Then to the apartment and a very fun, more food-informative, and incredible meal. PLAN on having more time than less...they are so generous with their time and sharing so much that they love and is at the heart of the life in Sicily. My wife and I love these two different events (on two different days) and by the end felt close to them. So close, we shared some of the best of the 'bad words' of both our languages! Fun bonus! We had a great 6 hour experience, shopping for ingredients in the open air market of Ballero. The Patrizia had us participate in creating a 4-5 course meal that we then appreciated at her studio. Lots of excellent food , very good Sicilian wines and and great sense of humour. Highly recommended. Patrizia was wonderful, engaging helpful and providing great lessons in traditional Sicilian dishes. Two hours of instruction and cooking after a great trip to the local market for the freshest ingredients. Then another 1 1/2 h enjoying the meal. This was a delicious introduction to Sicilian home cooking. We had a small group of 3 and so it felt more like an intimate dinner party than a class, which was great. Our two hostesses (mother and daughter) were excellent and gave us a great insight into not just Sicilian food, but Sicilian culture as well. Only qualms was that it wasn't quite as hands-on as we were hoping for and we didn't get to do the market tour as I think the host was trying to accommodate another guest who had to depart early for a flight and had already run a larger group earlier in the day. My wife and I booked this Sicilian wine/food tasting and didn't know what to expect. It turned out to be a great decision! Patricia and Alfredo, the couple who run the tasting, were the best. We spent maybe 3.5-4 hours trying 6 different wines (3 white and 3 red) and zibibbo (dessert wine). Everything was thoroughly explained by both. They also made traditional Sicilian foods with cheese to eat throughout the night. Everything was delicious and fresh. The wine was great, and we were free to have as much as we wanted. This all took place in their beautiful apartment in Palermo by Piazza San Domenico. However, I think the best part of the night was not the food and drink (although it was all beyond excellent), but Patricia and Alfredo themselves. They were so friendly, so genuine, and so funny! We spoke as if we knew each other for years and got to know each other well. It was just me and my wife at this tasting, so it truly felt like we were having dinner with friends. Although my wife and I were there over the "scheduled" 3 hours, we were never rushed out or told that the night had ended. We give this experience 5 stars, it is well worth it. You will try amazing wine, delicious food, and overall have so much fun. Even now, two weeks after our trip, my wife and I can't stop bringing up this night to everyone we speak to. So many thanks to Patricia and Alfredo! If we are back in Palermo we will definitely look them up! A full day that will last a lifetime. Food shopping with Marialuisa in order to prepare a gourmet lunch in the middle of a day that captured the essence of Palermo and its people. My wife and I will treasure this gem always. We booked this activity as we were stopping in Palermo on our cruise and we were both so glad we did. Our hosts met us in a location which was easy to find and a few minutes walk from their town house. The wine and conversation flowed all afternoon interrupted only by the cheese a snacks prepared by out hosts. We would recommend this tour to anyone and the bonus is we got to take any unfinished bottles of wine we wanted away with us. My boyfriend and I had the pleasure of meeting this beautiful family twice! We were able to do the cooking class and the wine tasting- both were unforgettable. We felt like we were at home with our family members cooking and talking- we learned and ate so much! Definitely worth booking and spending time with this beautiful family! we will be back! I did a private cooking class with Patrizia to learn more about Sicilian desserts. What I gained was not only now to make these recipes but an inside look at Sicilian life in Palermo. We had a great tour of a local market and discussed everyday life. She had delicious snacks prepared and a glass of wine to wash it down. We made so many different desserts (see photos) and I was allowed to take as much home as I liked to my family. I really recommend this as a great experience in getting to know Sicily and Palermo as much as learning authentic local dishes. We spent our second day in Sicily with Patrizia and her daughter first shopping at the local market for ingredients for our lunch FEAST then drinking wine as Patrizia whipped up an amazing authentic Sicilian lunch for us. Patrizia is delightful and a marvelous hostess who prepares a multi-couse delicious lunch while managing to entertain her guests as she goes. Recipes are shared after the class. Highly recommend this activity! This family is the absolute sweetest most genuine people I have met while in Sicily of shall I say in Italy!! These people are exactly what comes to mind when you think of Sicilian hospitality. They were well versed in both Palermo and Sicily as well as the cheese and wine they served, they welcomed any questions you may have with a very candid honest answer. I would encourage anyone visiting Sicily to support local people like this!! You will not find any other experience quite like this! Our hostess was truly wonderful! She picked up me and my husband at the cruise port and took us to two local markets to gather supplies for lunch. We started cooking when we got back to her gorgeous apartment. I was able to help her, and my husband was happy relaxing and drinking beer. We had the most delicious meal and were so full afterward! We were served caponata, pasta, swordfish rolls, and a delicious cake on her grandmother's beautiful china. She even let us try her homemade limoncello--excellent! We had such a great day talking with our hostess about Italian culture and truly felt like friends at the end of the day. I told her I was an avid home cook and she gave me a magnificent Sicilian cookbook to browse after lunch. Terrific day, and I would highly recommend this to anyone who is interested in food or just in eating! Amanda R Amazing experience!! Highly recommend to all visiting Palermo, Sicily. Patricia was a wonderful host and chef from the meeting point in the square to the wonderful shopping experience through the market to the preparation and enjoyment of the wonderful meal we prepared together. I brought home the recipes and do fully intend to try to recreate at home. My husband has said of our 15 days in Europe, this was the most enjoyable day we shared. Kim F This was a really terrific experience. Patrizia was warm, friendly and a great cooking teacher. She adapted the recipes for my diet. This is a great way to get to know Sicily and it's culture. I would definitely do it again. Maria Tollefson United States Patricia was wonderful. I entered her home as a stranger and left with having made a new friend. The food was amazing. Cooking with her was a blast. The wine flowed the conversation and laughter was endless all night. Her helpful tips were great. I can't say enough good things about this outing. It was clearly one of the fondest memories of our trip to Palermo! ryezzi I loved this class! My family and I spent 5 months in Palermo while my husband was working at the university there with a scholar exchange program. I decided to take a cooking class before we returned home, so I could learn how to cook some of my fav Sicilian dishes. I am really glad I choose this class. Patrizia and and her daughter Giuliana who is a chef are very talented cooks and really know their ingredients. They guided us thru the Capo and Vucciria Markets and knew just what vendors have the freshest ingredients. After gathering all of our ingredients, we went to a historic apartment near the beautiful Piazza San Domenico. There we were greeted with wine, beer, cheese, fresh bread, and Sicilian olives to start. We each had our own cutting board station at the large main table in the kitchen. I was impressed about how many dishes that we were able to prepare in such a short amount of time. We made eggplant caponata, spaghettone with a classic Sicilian tomato sauce featuring wild fennel, involtini rolls with fresh swordfish, and cassata al forno a baked cake with sheep's milk ricotta, candied fruits and chocolate chips. I loved everything that we prepared and thought that the eggplant caponata was the best I had ever had. After cooking, we sat down in the dining room while Patrizia and Giuliana plated all of the dishes and served wine pairings for each dish. I felt very much at home and it was a wonderful lunch. I had previously taken other classes in Italy at La Vecchia Scuola Bolognese and Gelato University in Bologna which I both highly recommend, but really liked this class for the variety of dishes and seeing whole meal evolve from shopping for ingredients to cooking to lunch. Probably the best compliment that I could give is that I have just returned home to Atlanta a few days ago and I have already made 2 of the dishes at home. Patrizia and Giuliana, thank you for such a wonderful memorable class! You are great hosts and very talented cooks. I had a one-on-one evening with the chef! Lots of fun, very knowledgeable, and so tasty and relaxed!!! Michael S It was the best tour we've been on in our four cruises, to date. Patricizia, the owner and chef made us feel at home immediately. It was like we were with dear friends making a wonderful dinner! Patricizia has a real passion for cooking and readily shares this with her guests. We have lived in Italy and shopped in the open air markets everyday but the other four people on the tour with us had not. They especially enjoyed going to the open air market in Palermo and shopping for the food we prepared. Most tours you go on allow you to see the new place but this one also allowed you to experience living in it! The different was incredible. We strongly recommend this to anyone who wants to immerse themselves in the Sicilian culture! Emma O A great insight into Sicilian cooking from a very talented local cook in her own kitchen in central Palermo followed by a fantastic meal with the best of local wines. I highly recommend this cooking class! Timothy S I highly recommend this Sicilian Cooking Class. It was a wonderful experience to shop at a local market, selecting the most fresh ingredients from a colorful open air market in Palermo's historic center. 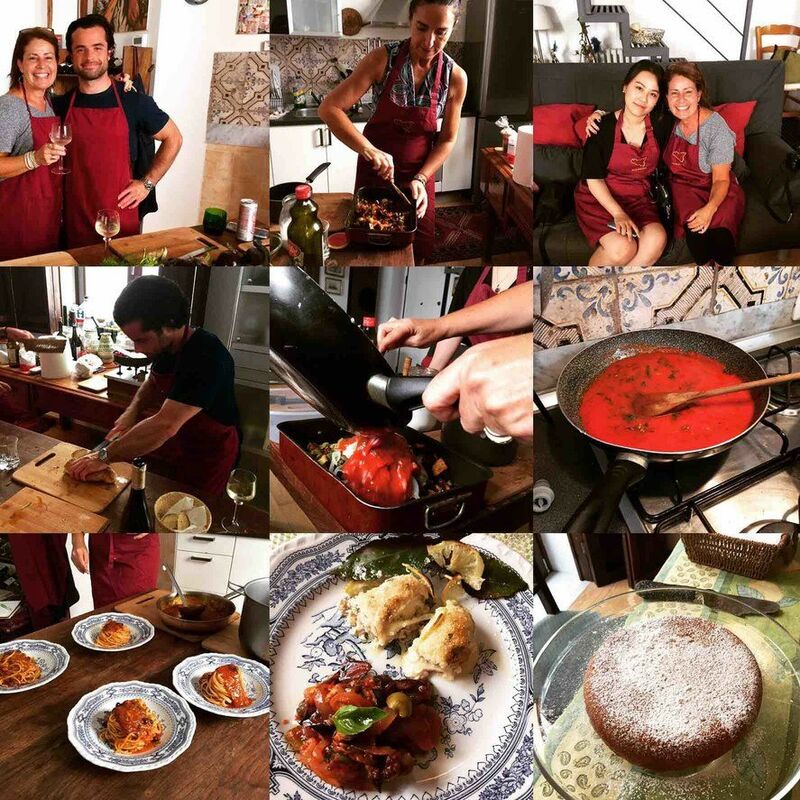 We returned to have a wonderful time learning to prepare exquisite dishes - and special cooking tips on preparing a set of wonderful dishes, enjoying wine, music and conversation improving my Italian and learning some Sicilian words!. I really highly recommend this course - as it will enhance your time in Palermo! Not to be missed. kristine b Excellent cooking lesson with Giuliana, best caponata I have ever eaten. Very enjoyable. Jo W A fantastic evening - Highly recommend. Great food, Great company. Tamara L I felt so at home during this cooking class. The truth is I did not do quite as much cooking as I had anticipated. But the mother, daughter dynamic was so welcoming. This even made me miss my mother. The food was superb. I truly can't wait to try and recreate these recipes at home, although I know they will not be nearly as good. I was very glad to have taken this class!! Do you not have enough time to visit some wineries in Sicily? Would you like to try the best Sicilian cheeses expertly paired with native Sicilian wines? Then we propose a Tour Sicilian Wines and Cheeses: a tasting of six typical Sicilian cheeses: Canestrato, Tuma persa, Caciovacallo fresco, Primo Sale, Ricotta infornata, Vastedda del Belice, accompanied by 6 Sicilian wines: Grillo, Nero d'Avola, Catarratto, Inzolia (Insolia) Frappato, and Grecanico, accompanied with brown bread from Castelvetrano or Monreale, and a rich salad. We will host you in a peaceful atmosphere inside a charming home of the sixteenth century, standing few steps from the famous market Vucciria. To close in sweetness, we will serve the delicious cassatelle of San Vito Lo Capo, stuffed with delicious ricotta cheese, fried at the moment, and sweet wine Zibbibo. Look at! A relaxed, informative and interesting tasting of local Sicilian wines and cheeses. A passioned host and her charming son led us through three whites and three reds, as well as cheese and other local foods. We also managed to taste her own homemade limoncello which was excellent. The wines were all local varieties, subtle and light. Highly recommended! We totally enjoyed our evening. Maria was a complete delight and the wine was delicious as well as the variety of cheeses. Best three hours I've spent in a long time. Wow what a wonderful afternoon. We booked this activity as we were stopping in Palermo on our cruise and we were both so glad we did. Our hosts met us in a location which was easy to find and a few minutes walk from their town house. The wine and conversation flowed all afternoon interrupted only by the cheese a snacks prepared by out hosts. We would recommend this tour to anyone and the bonus is we got to take any unfinished bottles of wine we wanted away with us. The best 3 hours we spent in Palermo. What a fun afternoon. Patricia is fantastic and the food is wonderful Do not miss it. Lovely way to spend an afternoon! We had a really nice time! The location was beautiful, wine and cheese were very very tasty and our host was so lovely and friendly! I would highly recommend this! Drop off and Pick up at your hotel on request at the moment of the reservation. "Our diner with Patrizia was excellent. The food was fresh, well prepare, and paired with wonderful wines. The setting was in a small apartment that over looked a small piazza in old Palermo city center. We had a lovely view of the piazza, so it was as if we were in our own private restaurant. Patrizia was our host and server while her daughter Giuliana was our chef. We had a truly lovely evening and experience. Grazie mille Patrizia!" This is Garrett and Gwen, we took your class this past week (the only 2 Americans). I wanted to email you to tell you how much we enjoyed the class and to say thank you. It really was one of the best things we did on our trip and we are still talking about how much fun it was. Thanks for all of your tips on Palermo. We had dinner at Gagini and it was one of the most unbelievable meals we have ever had. We also stopped at Mondello on our way out of town and it was beautiful, it is exactly what you think of when you think of Sicily. Thanks again for making our trip so much fun. Also if you could please send along the recipes for what we made that would be great. We really want to try to make it here. And finally I attached the pictures that you took of us using my phone. Chef Patrizia provided our group of 6 with an amazing Sicilian lunch. Her hospitality, culture, wine and food all contributed to a memorable event our group will talk about for a long time.Excellent experience! My husband and I thoroughly enjoyed our day with Patrizia. She met us near the cruise port, since we were in for the day from a cruise. She walked us to the market where she selected fresh produce, bread, cheese, and seafood for our cooking class. We then went back to her apartment to start preparing the food. We listened to music, drank wine, ate some delicious cheese and fresh bread, and enjoyed hearing about Sicily. We then enjoyed a wonderful meal. This experience is one that I won't ever forget. It was such a unique way to spend our time in Palermo and if you are looking for something fun to do, and you enjoy food, book a day with Patrizia. She is such a sweet and kind woman. My family of 4, including our 7 & 9 year olds, spent a lovely 4 hours with Patrizia & Guiliana (mother and daughter) on a days excursion from our cruise ship. Patrizia very kindly accommodated us, as I had booked the wrong day. She made no fuss and took us on a tour of the food market, where we purchased our ingredients for the lunch we would prepare. We got straight into pasta making and she very easily made our girls part of the experience- they loved it! We made 3 different types of pasta and sauces together with a beef dish and cassata dessert. We also enjoyed some typical Sicilian cheese, olives, bread and wine during the cooking process. Amazing! It was an amazing banquet and we left so satisfied, with full bellies and a new found love for pasta making. Thank you for opening your home to us and making us feel so welcome! You are truly hospitable and we will always remember Palermo from our unique experience with you. What a wonderful experience. I did this cookery day with two friends. We met our charming and friendly hostess Patrizia and shopped at the fabulous Capo Market for fresh ingredients. 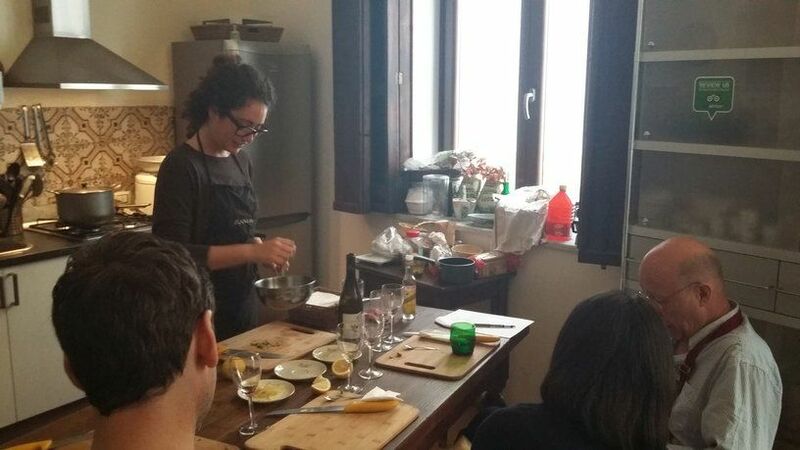 Then we went to a lovely apartment nearby and she showed us how to make delicious authentic Sicilian food. She is a great teacher and creates a calm, happy relaxed atmosphere. You actually learn a lot as you chat and cook without realising it. It really made the holiday in Palermo extra special. Highly recommended. Oh and you get the recipes too!! We had a fabulous day cooking with Patrizia today. The tour started with a walk around the markets to buy our ingredients. We then went back to an apartment very close to the markets to cook. We had a small group of 4 so we were all involved in the cooking. I don't eat seafood so Patrizia kindly adapted the menu with alternatives for me. We made pasta with anchovies (puttanesca for me), rolled swordfish with breadcrumbs (rolled beef for me) with caponata and cassata for dessert. Everything was delicious and Patrizia was great and showing us her methods as well as explaining alternatives for ingredients we may not be able to get in our countries. The cooking space was cool and clean and we enjoyed chatting and sharing travel stories with our fellow students. It was a lovely day and a great experience. Patricia was a fantastic host and teacher, she met my husband and I at the local food market where we bought our ingredients before heading back to cook a delicious meal. Local delicacies (cheeses, olives, oil...) were provided for us to try throughout the cooking class, as well as some delicious local wines. The cookery class took place round her kitchen table, which made us feel as though we were in the kitchen learning to cook from an old friend. It was familiar, friendly and just what we had wanted. The food was absolutely delicious too!! We did a market shopping trip and cooking class with Giuliana and her mom Patrizia one day and had such a fabulous time that we decided to do a City walking tour with Patrizia the next day! First - the cooking class and Capo market shopping. It was a lot of fun to experience a Sicilian market with a local. We were able to buy the ingredients we would cook later in the afternoon. Guilliana was a wonderful tour guide and even showed us some secret spots for beautiful photos of the city. She is a well traveled young women who speaks English very well. 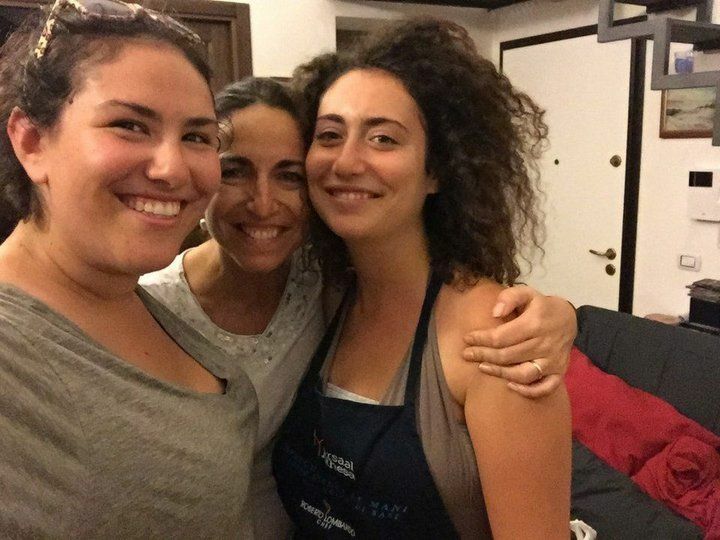 Once we returned to the apartment where we would cook, she (a professionally trained Italian chef), showed us how to prepare and cook the food one dish at a time. She was patient with all of our questions and very generous with the wine! :) Her mom Patrizia joined us and was just as friendly and welcoming as Guilliana. We ate, drank and talked all through the afternoon. We never felt rushed and were at "lunch" until almost 4:30 PM. We had so much fun with Giuliana and Patrizia that we went on a walking tour the following day. Patrizia has a wonderful love for the city of Palermo and Sicily. Her English is perfect! She openly answered our questions and gave us a nice, relaxed tour of the city, catering to whatever we wanted to see or were more interested in. I particularly loved the family stories of growing up in Sicily and the Sicilian folk tales. Truly an unforgettable day. I found myself talking about Patrizia and Guilliana all through the trip in Sicily, remembering stories they told or things they taught us that applied throughout the entire island. Our time with Giuliana and Patrizia made us love Palermo and Sicily more than we ever expected. It set the tone for a memorable experience in one of the worlds most beautiful places. It felt as though we made true Sicilian friends in the short amount of time we spent with this family. No matter what sort of outing or event you do, do it with this family. When we come back, we cannot wait to reconnect with them again. Bellisimo! We spent five very enjoyable hours with Marieluisa who was knowledgeable and we thoroughly enjoyed our relaxing walking tour in Palermo with her. Her English is excellent and she is a charming companion showing us hidden areas of the city and giving us an insight to Palermo life. This culminated in an excellent sicilian lunch personally by her in cooked in a sweet apartment overlooking a beautiful square. It was a great start to our days in Palermo and she also gave us many tips to further hidden delights - including having drinks on the roof terrace of the Ambassador Hotel which with its fantastic views was a joy in the spring sunshine. We had a private tour which was a bit of a treat -we were 4- and despite our varied interests we all thoroughly enjoyed it. Thank you Marialuisa! CanNOT recommend this tour enough. Patricia was the most inviting and generous hostess. The home from which she usually conducts these tours was being renovated, so she met us at Piazza San Domenico from where we walked just a few steps to a very quaint apartment which overlooked the square for our tasting. We sampled 6 delicious Sicilian wines with cheese, bread, olive oil and THE most delicious caponata ever. 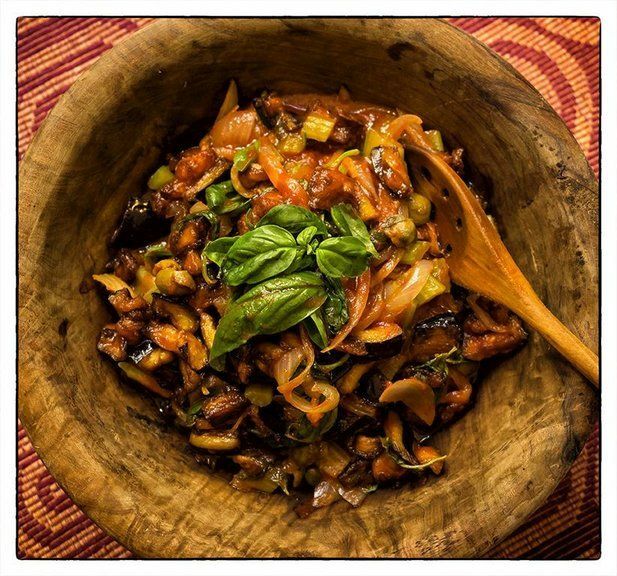 She also teaches cooking classes, so her caponata is seriously to die for! We finished the tasting with cake with ricotta cream. AGAIN...to die for. But wine, cheese and delicious food aside, Patricia was the one who made this experience what it was. From the moment you meet her, you feel as if you have reconnected with a long lost friend. She never meets a stranger. Instead, she invites you into her home and teaches you the Palermitan culture through wine and food which is such an integral part of their way of life. Even if you don't like wine, I would recommend this tour to anyone coming to Sicily, just to be able to indulge in an authentic Palermitan experience. Patrizia was amazing! She took us to a beautiful home where we spent two lovely hours learning about 6 single varietal local wine - and 5 local cheeses as well as Patrizoa’s own olive oil!! Fabulous fabulous time!!!! We did this tour on our first day in Palermo and it was a great way to get acquainted with the city. Plus our guide was great and so was the food and hospitality. Simon was a great tour guide and our lunch was fantastic. I took my parents - in their 70's - on this tour and it was perfect for us as a family! Patricia's demeanor and expertise were outstanding, both in the market as we purchased food and in the kitchen as we sipped wine and made a yummy lunch. Culturally and culinarily, it was an A+ experience. Enjoyed spending time with Patrizia. Loved her knowledge on the produce. Very friendly and hospitable. It was a very personalized tasting. We enjoyed it very much and highly recommend. Patrizia was a great guide. She know the historical places and great places to get street food or a full dinner. Very personalized market tour and cooking experience with wonderful selection of local wines. Patrizia is an experienced chef and gracious hostess who was able to easily accommodate changes to the menu for our group’s preferences. It was the highlight of our time in Palermo. Great tour, the Catacombs were amazing and Montreale Cathedral was magnificent. Our guide Patrizia was very good and at the end of the tour prepared a terrific meal for us. I recommend this tour. 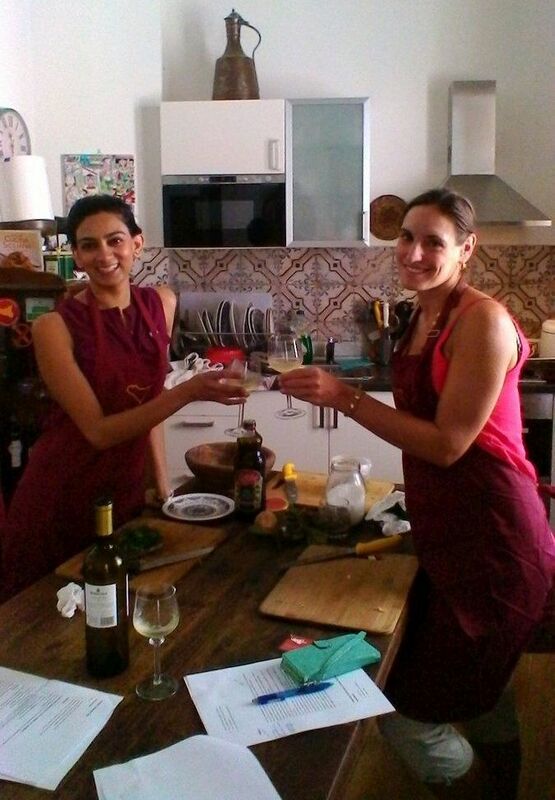 My friend and I did the cooking course with Patrizia last weekend. We started by going to the market and seeing all the beautiful produce and picking out what we needed for our dishes. We arrived at Patrizia's beautiful apartment shortly afterwards. The kitchen was lovely with authentic Sicilian tiles and everything we needed for cooking. She open up some olives, bread, cheese and olive oil for us to enjoy whilst we cooked. We also had a delicious glass of Nero D'Avalo and were told to help ourselves throughout the time we were cooking. Patrizia's attitude to cooking was so calming and relaxing, it felt like we were at a friend's house helping her make dinner. She was so friendly and approachable and answered any questions we had. Once we had finished cooking, we took a seat at the table and Patrizia served up our cooking. It was absolutely delicious! What a great idea -a walking tour in Palermo with Marialuisa! What a nice personality ... she knows the merchants in the market and the hidden treasures and byways of the city. With a good command of English, she showed a great read of our interests and physical capabilities as we made our way around this bustling, fascinating city. A highlight was the very personal meal she prepared for us in her nearby apartment at the tour's end. Patricia was courteous, fun, patient and a great teacher. It felt like you were making dinner with a friend in their home. What a great tour. Patrizia was wonderful and very knowledgeable when it came to the different wines and the cheeses that went with those wine. Her capanota was out of the world. It was a great 2 hours. I would highly recommend this tour. Patricia was a splendid guide, knowledgeable understanding and a great communicator. In encouraging our interaction and meeting our interests we could learn so much more about Palermo, Sicilian culture and lifestyle in addition to the history before our eyes. The home cooked meal allowed us to share recipes, techniques and cooking preferences in congenial surroundings. A cooking lesson in her studio apartment kitchen would be a wonderful experience and greatly to be recommended. Its position amid a maze of dark and narrow lanes allowed it to stand out as a true centre of good taste and impressive hospitality.